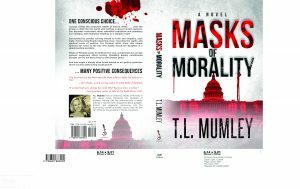 Masks of Morality is getting a Makeover! There are also a couple minor tweaks in the cover design. Rather than be branded as a “Political Twister,” it is simply “A Novel.” This decision was based on feedback I received by a reader who loved the story-line, but was disappointed that it was not actually political. Although I was delighted to hear this since my story was not meant to be political so much as how corrupt politics affect society, it made me wonder: How many other readers were deceived by the cover expecting something else? I love feedback, whether positive or negative. Constructive criticism only helps me hone this craft called writing. Every day I learn something new, especially through my weekly writer’s circle. In the end, my new friends in that support group have been my best editors. Thank you for reading, and please offer any critiques you may have as well!